This unit is something I came up with a while ago as I was subbing for a group of first graders. 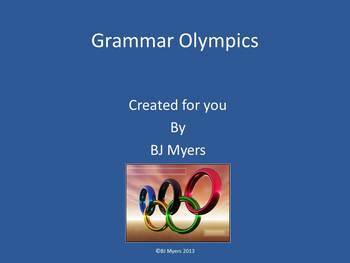 Grammar Olympics is a fun and creative way to get students energized about editing sentences. The unit can be used with students in grades 1-6th and encompasses a wide variety of grammar concepts. I've found that students normally hate doing daily oral language but they love the competition that Grammar Olympics give them. This works best doing a boys vs girls challenge, but you can split your class into what ever teams you like. I've included enough sentences that you can do two sentences every school day. Most importantly..enjoy this activity with your students.